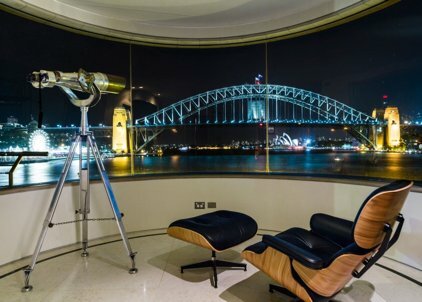 These Classic WW11 binoculars majestically positioned overlooking an Australian icon sadly had a misfortune when they were knocked from their perch crashing onto a tiled floor. The damage was not just superficial but also the hearts of the binocular, its prisms were destroyed beyond repair. 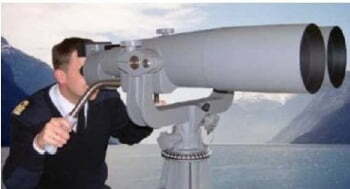 This type of large binocular is very much a collectable item which has gained in value since being given a work over, to create a retro appearance. The first known cleaning up process of the body commenced back in the 80’s in the UK. It is achieved by removing all the old military grey or green paint and then sand blasting and painstakingly hand and machine polishing it back to the original die cast alloy and brass. The first end product was spotted by an astute US collector at the Portobello Road Antique Markets in London and as they say, the rest is history. 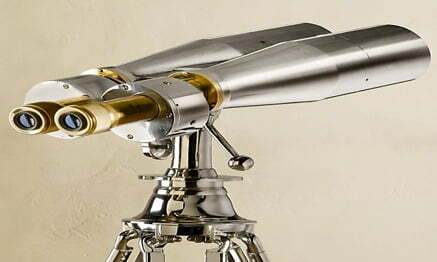 You will now find it’s not only the classic large Japanese binoculars that are having the treatment but also some of the beautiful European, American and Russian military binoculars and large optical devices from a bygone era. There is now an elite group of collectors around the world who have made them become good propositions for investment, with sales fetching large figures at auction rooms and antique shop around the globe. Due to their shear size they are very much a focal point, however they are not worthy of their grandeur if they are not optically functional. In 2016 I was contacted by the Administrators of this Sydney Harbour property to see if this majestic lady was salvageable. Not one to shy away from a challenge I was keen to offer my optical repair and restoration services. 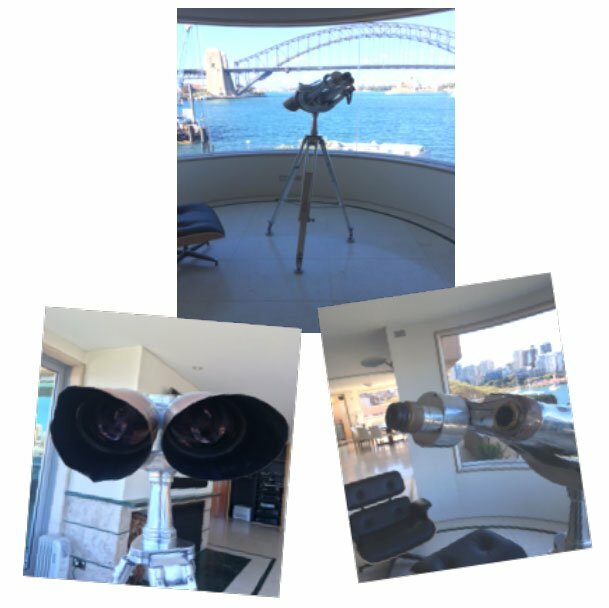 After many hours of work stripping cleaning and repairing all the damage and having to source replacement prisms and lenses from around the globe, we were able to eventually bring the lovely lady back to her former glory and place her in pride overlooking Sydney harbour. These particular binoculars were manufactured by the Tokyo Optical Company around early 1930’s They along with Nikko Optical produced the largest number of military binoculars and optical devices for the Japanese during WW 11. There were a number of other manufacturing companies also emerging around the same period in Japan those being Nippon Kogaku, Ashi Optical and Takachiho Seisaku Sho (now Olympus). Prior to WW 11 the Japanese engaged the services of a number of prominent engineers from Zeiss to assist in the manufacture of optical devices however the Fujii brothers Ryuzo and Mitsuzo were accredited as the pioneers of optics in Japan, partially for military use. They established Fuji Lens Works in Tokyo (later to become Fujinon) using glass supplied by the German company, Schott and optical measuring equipment supplied by Zeiss. When Ryuzo Fujii graduated from Tokyo Institute of Technology (after having studied optics and then having the fortune to further study in Germany for another three years) he attained a great deal of knowledge which he was able to bring into the manufacturing process of optics for the company. With his brother, who was also a qualified chemist they produced the first commercial binocular the Victor 8 x 20. Their success grew and the company even to this day manufactures for the military and armed forces around the globe.